In the first part of our look into the concept of smart homes, we discussed how technology is becoming integral not just into our lives, but the functionality of the very homes we live in. We looked at several technologies that have already made the breakthrough into widespread use, including voice activation, safety monitoring and labor-saving devices such as robot vacuums. In part 2, we look at the cutting edge of technology, things that a lucky few are benefiting from now but are poised to revolutionize how we live, and ideas that are on the horizon, or far beyond it. We try to implement the latest technology into our designs The New American Home 2017 is jam packed with all the latest gadgets. We start with energy, because it is the driving force for everything else. If we want to have electric cars, constant monitoring in the house and all the rest of the useful technology we all love, then finding better ways to power it all should be key. The good news is that this is one of those technologies where the future is already here, although at a significant cost and in very few areas so far, but that will change over time. A familiar name is driving the innovation in energy technology, Elon Musk’s Tesla. Tesla has a complete home power ecosystem available now after purchasing a solar panel manufacturer last year. Complimenting its class leading vehicles, Tesla’s power system for the home was initially marketed as a way of charging your electric car using solar energy but with advances in battery technology and high efficiency solar panels, it has become much more than that now. What Tesla now offers is a completely integrated system. It begins with the solar roof, solar panels that replace your roof tiles entirely so the whole roof becomes a huge energy generator. The advantages of this idea are less weight on the roof as compared to adding solar panels over the top of existing roof tiles, greater power generation due to the larger area that solar panels can cover, and aesthetics. 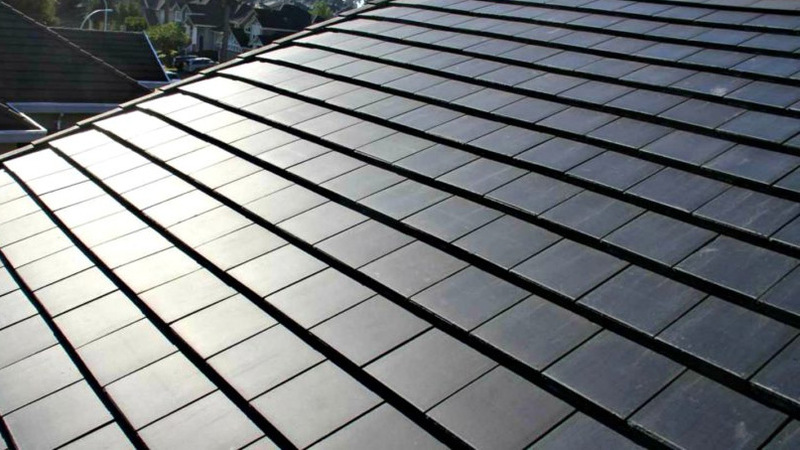 An entire roof of solar tiles looks much nicer than blocks of solar panels stuck on, and because they are designed to mimic various tile and slate appearances, don’t even look like a solar roof when installed. The solar roof can be integrated with a Powerwall battery, which stores energy generated that you are not using immediately. This product was originally launched a couple of years ago on its own and is now in its 2nd generation form offering more efficiency and greater capacity. These wall mounted batteries can be mounted internally or externally, they look great anywhere and are easily expandable for extra capacity. One Powerwall can hold enough charge to run a home overnight without issue or even charge your electric vehicle, so you may not need as many as you think. With a solar roof + Powerwall battery set up, it is possible to use electricity straight from the panels during the day and from the batteries (charged by the panels) overnight. This system could effectively reduce your energy bill to virtually nothing, and just as important, give you reliable power independent of the grid. The system can be set up to recognize a loss of power from the utilities, in which case the batteries or solar panels would cut in immediately. So in the case of a blackout, your home would retain power and do so with no interruption as the power source change is so fast. This system is now available from Tesla. Several competitors are beginning to appear on the market offering batteries that work in a similar way. Currently there is large up-front investment and availability is limited, but it is clear that the advantages such systems will grow in popularity and as volumes rise, affordability will come. It is worth noting that Tesla actually runs its entire car factory using the industrial versions of this very technology, showcasing its reliability and potential. For our homes, independent energy systems that harnesses solar power are the key to the true technological advances needed to create the reliable, cheap energy we all hope for. Making life easier is always attractive, and the good news is that there are several automation systems out there to do that. From lighting to shades and climate control to whole home systems, there are products that put everything under your control via keypads, remotes or a smart device app. We have tested several of the automation systems on the market to see just what they can do, and what they are like to live with. One of the most advanced automation systems on the market today is from Control 4. Their smart home system offers everything from single room systems to complete home monitoring and control via an app. In fact, with a choice of home automation options in the market, Control 4’s ability to create a bespoke solution that does just what you need is a major advantage. Control 4 also offers room panels that are very attractive, come in a range of colors and fit with most décor styles, but it is their functionality that really shines. Control 4 can control all your lighting, heating or air conditioning, and entertainment needs. It can even lock or unlock doors and arm the security system if you want, the options available are endless. Best of all, you can set Control 4 to do a number of things at once. For instance, you can set one touch to turn the heating up, lock the doors, and put some music on, perfect for getting home on a winter evening after a long day at work. You are really only limited by the automated kit you put in the house, and with a choice of apps, wall mounted control pads, portable pads and even traditional remotes, you can find the interface that works best for your home. When it comes to home automation, Lutron is consistently one of the market leaders. Lutron offers a highly developed system that has benefited from years of refinement combined with integration of the latest technology. Primarily focused on lighting and shade control, Lutron can integrate with other remote systems to control TV and entertainment systems as well. Lutron’s latest development allows its system to integrate with Google Home or Amazon Echo to essentially give you voice control over your home. The system is not as configurable as Control 4 as it offers less control device options; however, voice control really is the ultimate in-home automation and Lutron is one of the first to market with a voice compatible system. Automation is wonderful, in fact it’s actually quite hard to think about living without it once you have gotten used to it. Technology is taking us to new places where the space in our homes becomes controllable, creating the ultimate in adaptable interiors. Perhaps the most forward-thinking innovator in remote-control glass walls is Sky-Frame. Sky-Frame offers a far more elegant, frameless wall design compared to other offerings and really does invoke images of futuristic dwellings and science fiction. With its near silent motor control and incredible versatility, the incredible walls fit into many interior styles and provide the ability to change the space in a room with the touch of a button. Whether an interior divide or an exterior wall, the Sky-Frame system is everything you could want. At the touch of a button the glass walls glides open, bringing the outside world right into your living space. This technology is not just helping your life, it is actually changing the world around you and the space you enjoy. Technology can help adapt your interior spaces to achieve your desired living conditions too. Haiku fans are billed as the world’s smartest fans, controllable via an app, remote, wall control, or integrated with Amazon Echo. These fans adjustable fan speeds and lighting levels and even include sensors in the SenseME™ system to react to light and temperature changes for you. With near silent operation and beautiful bamboo finishes, the Haiku fans are not only smart technology, they are a wonderful addition to any interior, adding a modern look combined with the natural beauty of the materials. Whether it is how we power our smart home, or the technology we put in it, advances are happening every day. The cutting-edge systems we have access to now offer incredible functionality. We have discussed a variety of very different devices and technologies and all have the ability to enhance our quality of life.